Don’t miss this exciting opportunity to experience some of the best restaurants the Valley has to offer. Restaurant Week is the perfect time to visit your favorite restaurant or try something new, as chefs prepare delicious 3 courses meals for your dining pleasure, priced at $26 or $38. JUNE 3-12th! 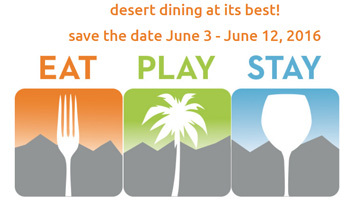 Desert area hotels and attractions are offering great rates too! Splash House heads back to the desert for this summer for its fourth year in Palm Springs, June 10-12 and August 12-14. 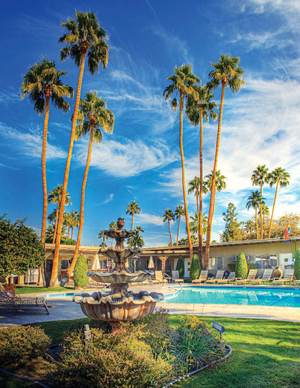 The festival returns to the colorful crowd favorite of the Saguaro Hotel and checks in for the first time at the iconic multi-pool Riviera Resort & Spa. After Hours found its home at last year’s memorable Air Museum parties, and Splash House will host its biggest late-night program yet this summer on the tarmac. The Idyllwild Arts Foundation proudly presents the 23rd annual Jazz in the Pines Festival featuring over two dozen bands. Performers and fans of jazz, blues, and R&B have a breathtaking mountain campus to themselves after the departure of the Idyllwild Arts Summer Program’s thousands of arts-lovers and before the first semester of the Foundation’s residential high school, Idyllwild Arts Academy. And as always – shop local! Every Thursday evening in downtown Palm Springs, enjoy a diverse array of artists, artisans, entertainers, assorted fruits, vegetables, fresh flowers, jewelry, international cuisine, and don’t forget the sweets. Open-air shopping at its best. Open from 7 a.m. Saturdays and Sundays all year. Bargains galore. A great way to start your day. BEST PLACE TO STAY WITH THE BEST LOCATION ?? InnDulge!